Last week we concluded the high voltage system. 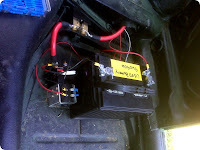 Linked 13 x 12v batteries together to create one giant 156v battery. This week we wrapped up the low voltage system. 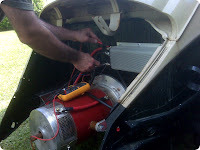 This powers the starter (to activate the batteries,) the throttle (to control how much juice goes to the motor,) the lights, the radio, and everything else normally associated with a car.Roger did the bulk of the complex wiring work. 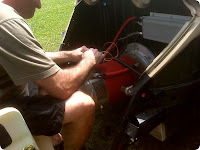 I did the grunt work, fetched any parts we needed, and helped "fish" the lines though the ductwork in the Beetle's body. For the short term, I'm using a recycled 12v battery. Once everything is lit and we know it works, Eventually the used battery will be replaced by a 12v 100 amp hour UPS battery. But that thing weight 80s and costs a little bit more. Roger wired up everything kinda quickly and we lit the beast. 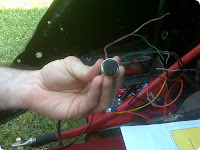 When he keyed the ignition, we heard a loud CLICK as the contactor (next to the battery) snapped shut, creating the 156v circuit between all the batteries. Then Roger touched the throttle. Nothing. He pushed it further. Nothing. All the way down. Nothing. No go. The Beetle wouldn't move. And the hunt began. Whipped out the Fluke and started testing all the wires and connections.Full charge on the batteries. All the fuses were in place. The throttle was sending signals through the lines. But the controller wasn't sending any signals to the motor. And eventually we noticed the controller wasn't displaying any signs of being powered. It had indicator lights, but they weren't lit. In the end, Roger isolated the problem to the new connector. It has ten pins. He thought the pin at the 1 o'clock position was the first pin and wired everything from there. Unfortunately the pin at the eleven o'clock was the first pin, and everything after that was mis-wired. Roger will have to cut out the connector, re-pin it, and then re-install it. Two to three hours worth of extra work. Hopefully we'll get that done on Tuesday or Wednesday. And THEN the tires will spin.